Even before the opening credits, the action of Episode 6 picks up right where it left off in Episode 5. What is at stake here for Uhtred? First, he has to survive the desperate, lopsided battle he’s fighting. Second, he has to re-capture Skade in order to break the curse she’s placed on him. With Edward’s help, he manages to live. But Haesten escapes with Skade, so the curse remains, and it leads to unrest among Uhtred’s followers. Finan tries to act the peacemaker between Uhtred and Sihtric, but he fails. Sihtric’s departure raises the possibility of more conflict to come. Uhtred’s brief meeting with Alfred after the battle at Benfleet (no bees, by the way) is once again a wonderful portrayal of the man who is this king—his obsession with the idea of an ENGLAND, his determination to rule by law, his painstaking preparations for what must happen after his death, and his pitilessness toward those he perceives as enemies. He lived in a brutal time, in a brutal world, when a God-fearing Christian king saw it as his duty to bring heathens to heel or to destruction. He tells Uhtred that he was tempted to delay giving the order that would prevent the slaughter of Uhtred and his men because “I would have seen victory without you, and it would have been all you deserved.” Harsh. Yet Alfred is still trying to bind Uhtred to Edward because he knows that Edward will need him. Haesten arrives at the Danish camp with Skade in tow and the news that Alfred lives. 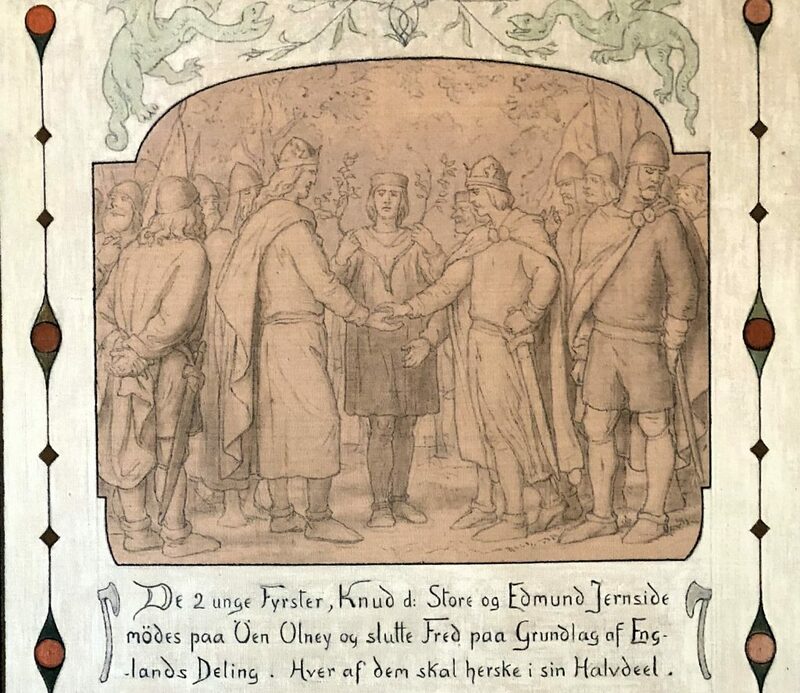 Æthelwold, duped by the devious, double-crossing Cnut, is ordered to Wessex to beg forgiveness from Alfred for his treachery and while he’s at it to murder Uhtred, thank you very much. Magnus Bruun as Cnut. Uhtred calls him a weasel. He’s much worse than that. Æhelwold realizes he’s been stupid to trust the Danes, but he has a plan. We do not know what it is, but his plans have not worked out very well in the past so it’s hard to believe he’ll do any better this time. Meanwhile in Wessex, some of what Uhtred has said to Alfred has gotten through to the king. He gives Edward full credit for his actions at Benfleet—but with Alfred, nothing comes without strings. Plans for Edward’s marriage are in place, and Edward, mollified by his father’s approval, accedes to them. Much of this episode is spent with Uhtred and Brida as they mourn Ragnar. Information shared between them leads to some thawing on Brida’s part, but not quite forgiveness. Uhtred and Brida (Emily Cox): an uneasy peace. Both options unappealing, I’m thinking. THE BURNING LAND ends with the battle at Benfleet, and things play out rather differently in the book than they do in this show. I suppose there are purists who want THE LAST KINGDOM to be exactly like the novels, but I’m not one of them. As long as the characters have the same motives, personalities and attitudes, I am happy to see the story line go in a direction that is somewhat different from the novels. As Episode 6 wraps up we are moving into the pages of DEATH OF KINGS, and from the title alone you must know what’s going to happen. I’m already in mourning. It’s an interesting exercise to try to imagine how long it took for news to go from place to place in the early medieval period. For example, how long did it take for word of the death of a king to travel the length of England in the 9th century? Days, perhaps weeks. And when word of such a significant event spread, was it in fact true? In Episode 5 of THE LAST KINGDOM 3 the Danes learn that Alfred is dead, except that we’ve just seen him preparing for war. Someone is in for a surprise. But the arrival of news of Alfred’s death is immediately followed by the discovery of Ragnar’s murder – a departure from the plot line of THE BURNING LAND. Emily Cox is wonderful as Brida, conveying grief, anger, fury, despair and suspicion all at once. Cnut has promised Æthelwold that he will protect him, but if Brida ever learns that he murdered Ragnar, the dweeb doesn’t stand a chance and Cnut doesn’t seem like the type who would expend much energy protecting a sniveling Saxon. The viking army stays together, though, despite Ragnar’s death. Meantime Haesten is down in Benfleet trying to impress Skade and getting nowhere. They trade boasts, threats, and promises, and although Haesten is a brute Skade has no trouble keeping him off balance and wary of her. It’s hard for us to know if she wants Haesten to kill Uhtred or the other way round. It seems what she really wants is the winner, and she doesn’t much care who it is. Æthelflaed, though, knows who she wants, and it’s not her husband. Uhtred is only unwilling to take what she is offering because he believes that Skade has power, that Skade will know if they become lovers, and that she will destroy anyone he cares for if he doesn’t find a way to prevent her; and when Brida arrives with news of Ragnar’s death Uhtred is even more convinced that Skade’s malevolent power is responsible. Which means he has to go after her. But he needs men if he’s going to attack Haesten at Benfleet. So at Æthelflaed’s urging they go to Alfred – or rather, into a mare’s nest. Æthelred is there, and he’d just as soon see Uhtred and company dead; and Alfred, who is drawing on all his strength just to stand upright is unwaveringly hostile. He refuses Uhtred’s request to mount an attack on Haesten. And now we have another significant change from the novel, but it still works beautifully. Instead of Æthelflaed riding with Uhtred to defend Mercia by attacking Benfleet and Alfred later sending Edward with an army as in the novel, it is Edward who goes to Uhtred and promises him that he will have the men he needs. It is Edward who tells the king that he is not yet ready to defend Wessex against a massive Danish army. He needs more time. So Uhtred goes to Benfleet with a small company, although he has no way of knowing if Edward and a large army will follow as promised. At this point we are given a couple of terrific images that foreshadow the future. The first is that moment when Æthelflaed and Edward stand together, watching as Alfred’s troops cheer their king. Anyone who knows the history knows that brother and sister will rid Wessex and Mercia of the Danish threat, that they will finish what their father has begun. And then there is that moment when Alfred painfully reaches for his sword and raises it to the shouts of his warriors. It’s a moving image that is a nod to the statue of the king that stands on Winchester’s High Street today. This entire series—its story, its haunting landscapes and dark, brooding interiors–seems to echo the stark, sad beauty of the poetry of the Anglo-Saxons. So Uhtred leads his small band to Benfleet. There’s some trash talking between Haesten and Uhtred, and anyone who has read the novel is asking, “Will there be bees?? ?” And then we forget about the bees because Haesten attacks and Alfred, hidden with his army among the trees, watches in grim silence as Uhtred and his men are surrounded and the slaughter begins. Edward is protesting, and Alfred is unmoving until, at last, we perceive what Alfred is doing, except he seems to be taking things too far, and then—the credits roll. On to Episode 6. And who knows? There may still be bees! In Episode 4 scriptwriter Stephen Buchard takes all the elements of the plot of THE BURNING LAND and mixes them up to tell essentially the same story but in a way that will hold quite a few surprises for those who have read the novel. And that’s all to the good! We like surprises. This episode is rife with conflicts and shifting alliances. Uhtred’s face-off against Bloodhair is the first and most visible conflict, but before long the Danish leaders are plotting against each other in secret just as Uhtred said they would. Cnut, who has just been itching to make trouble of some kind, allies with lickspittle Æthelwold—an unlikely pairing. It leads to a savage and cruel act that certainly took me by surprise, especially considering the dweeb responsible for it. Listen close and you’ll hear the Norns singing. And given how events play out by the end of the episode, we are sure to see the leaders of the Danish army exacting vengeance on each other before long. On the Saxon side, Æthelred bows to Alfred’s command to join him in defending the south against the Danes, but hopes that Alfred will stop malingering and die already. Uhtred arrives in southern Mercia and has his hands full, not just with Danish enemies but with 3 women—4 if you count the abbess of Winchcombe who wants no truck with pagan Danes. “I don’t like you,” she snarls at Uhtred, looking just like everybody’s worst nun nightmare. That’s just before the convent at Winchcombe becomes Battle Abbey. There’s some nice parallelism in the portrayal of Uhtred’s interaction with Æthelflaed and then Skade, and I was glad to see how that played out. But poor Uhtred has been cursed again, and even worse, he’s had to make a promise to Skade that, from where I’m sitting, sounds like a fate worse than death. With any luck he won’t have to keep it, but he hasn’t been terribly lucky of late and that curse is just hanging over his head like a naked sword. The ætheling Edward does his best to rebel against his father, but he’s outgunned. Dad pulls out the old “Do you think I wanted to be king when I was your age?” argument (we’ve all heard that one, right?) and Edward wilts. Matters of the heart are not important in royal Wessex; only duty. And in the blink of an eye, the old adage ‘Like father, like son” is played out before our very eyes. Edward’s soon-to-be father-in-law Æthelhelm shows up, and because even Beocca thinks he’s a prick we know he absolutely must be. But as if to offset the contemptuous, full-of-himself Æthelhelm, that rapscallion Welshman Fr. Pyrlig returns to Winchester, too. Hurrah! Now, let’s talk about the Danish camp. It’s pretty darned luxurious. Way too luxurious to be believable. There is some grumbling among the warlords that the army is travelling too slowly, and it must be because of all the stuff they’re dragging along with them. Tents, beds, tables, ale flagons…honestly, the vikings were really good at quickly raising fortified camps, but I don’t think their camps were this lavish. Ragnar’s tent looks practically like a big top. And did you notice the candle lanterns on the table? Pretty stylish for vikings—they look like they’re made of glass and metal, although in the 9th century they would have been made of horn and wood. They were an invention of…wait for it…Alfred the Great. Yeah, probably the Danish army didn’t have candle lanterns on their tables. Or even tables. But the tents make a nice backdrop for the skullduggery going on in the camp that night. We have to wait until Episode 5, though, to see what comes of it. Episode 3 begins at Dunholm, where Uhtred has been reunited with Ragnar and Brida. Along with Uhtred’s companions is an old friend from Season 1, who is a wonderful stand-in for Uhtred’s conscience, pricking him about who he is and what he is, and arguing on the side of Alfred and the Saxons. Perhaps the most surprising reveal in this episode is the discovery that Æthelred’s right hand man, Aldhelm, is actually a Mercian who loves Mercia, and who has realized that Æthelred is not the king Aldhelm had hoped he would be. Aldhelm is given the best line in this episode when Æthelred guts the messenger who brings him some bad news. Alfred is busy with a scribe who is writing down the Anglo-Saxon Chronicle. I love it when the show refers to an actual historical item. Yes, Alfred was the one who commissioned the Anglo-Saxon Chronicles as they have come to be known, giving us a contemporary account of what was happening in England at that time. He had several copies made and sent to various monastic centers, and some of them kept updating the chronicle through the following decades. We have six different versions of it, in different lengths. One version continues into the 12th century. 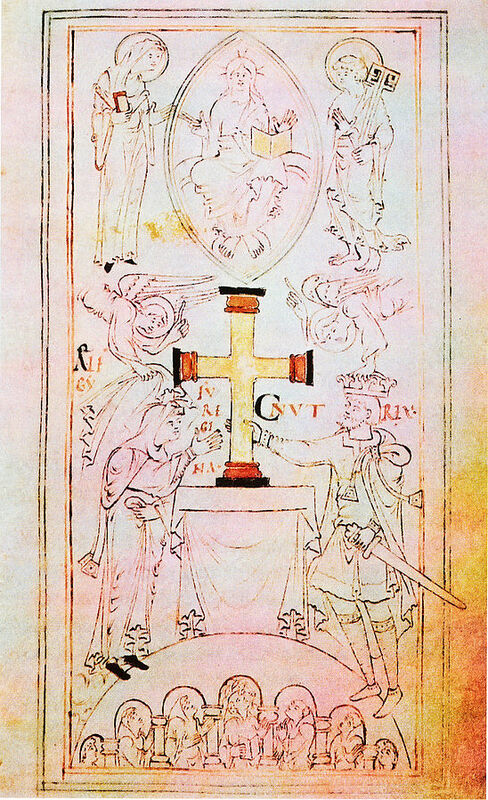 The picture shown here is not, alas, copied from one of the Chronicles but from a 10th century manuscript describing the duties of kingship. Today it lives in the British Library. There is a wonderful scene at Dunholm with Ragnar playing ringmaster at games pitting the Saxons against the Danes. Hilarity ensues until Hæsten, Bloodhair and Æthelwold show up to urge war against an ailing Alfred and the atmosphere gets immediately tense. As if Uhtred didn’t have enough trouble from the shade haunting him, his conscience is goaded, unwittingly, by Æthelwold and Ragnar. “We are both traitors, but for a good cause,” Æthelwold tells him. Later Ragnar tells him that they can form a great army and take Wessex, and “you have made it possible by abandoning Alfred.” Poor Uhtred is miserable, and nobody else looks particularly happy at this gathering, either. Meantime Skade has been trying to get inside Uhtred’s head with promises of kingship. I like Stephen Buchard’s move to have Uhtred kiss Skade merely for the purpose of spiting Bloodhair. I think I know where this is going, but I’m not saying and I could be wrong. Down in Winchester poor Alfred is struggling against the disease that is killing him, and there is a tender scene with Ælswith that I found moving. He is also troubled by his wayward son who has gone and wed some girl without permission. Just an fyi: the girl has twins, a son and a daughter. And that son, Athelstan, will grow up to be one of the greatest kings of England ever. But not in this season, or even next. Meantime, we have Episode 4 to watch. In this second episode of THE LAST KINGDOM 3, screen writer Stephen Butchard veers significantly from the plot line of the book, choosing to focus on the major conflict that Uhtred faces: is he a Saxon or a Dane? And Butchard emphasizes as well the increasing tension between Uhtred and King Alfred as the king tries to ensure that his dream of an Englaland will be realized after his death by forcing Uhtred to give his oath to young Edward. It’s a good decision by Butchard to go that route, but has he gone a little too far with the Alfred/Uhtred conflict? In one extremely taut scene Uhtred physically abuses the king—something that the Uhtred of the novels never does. It’s difficult for me to see how Butchard is going to give Uhtred a way back to Alfred after that, and I’m very curious to see how he does it. Or if he does it. We cannot really tell what Alfred is thinking and feeling at the end of that scene, seated on his throne, his eyes misting with tears and his face stricken. Is he thinking he has failed England? His son? Or is he regretting pushing Uhtred so hard? Stay tuned! Meantime, the new plot line that follows an injured Uhtred north is terrific. His inner conflict about his betrayal of the king is portrayed wonderfully in a way that will make fans of the show sit up and screech with excitement. Well, I did, anyway. And once Uhtred reaches Durham, it was another brilliant stroke to flash back to the first season, and the moment that Uhtred first met Brida (Emily Cox). Ragnar’s (Tobias Santalmann) jubilation at having Uhtred back—as a Dane, not a Saxon—is in stark contrast to Finan’s misgivings about what Uhtred intends regarding Wessex, and it all stokes Uhtred’s continuing inner conflict. I like the way the show has taken a single line in the novel about Skade and Brida, and really run with it. “…the two women had recognized their similarity and had immediately bridled with hostility.” They are hostile, all right. Not only that, Brida out-sorceresses the sorceress, beautifully setting up plot developments we’re going to see further along. Well, maybe much further along. We have not yet been given any hint of Skade’s back story which is laid out in the novel: she has a wealthy husband in Frisia who wants her back. Will our story line go there, as Uhtred does in the novel? Maybe. Maybe not. I think the husband might be ignored in order to give Cnut (Magnus Bruun) and Bloodhair (Ola Rapace) bigger roles to play, but we’ll have to wait and see. There are a lot of plot lines to follow. Æthelwold was at the bottom of getting Uhtred out of Wessex; he’s conniving with Æthelred against Æthelflaed, and with Bloodhair and Hæsten against the king. He’s always been a weasel’s turd, but up until now his efforts at skullduggery have been unsuccessful. Maybe this will be his season! Hild and Finan get some of the best lines in this episode; Aelswith is annoying, as ever (that eye roll!). Poor Beocca has to once again choose between the young man and the king, both of whom he loves; and boy, does he let Uhtred have it at one point. Fine acting by the entire cast. Do you ever wonder about the fact that all these characters look so young? The actors’ diets are probably much better than anyone could have had in the 9th century, for one thing. But they are young—or at least, I think so. Tobias Santalmann who plays Ragnar is 38; Alexander Dreymon (Uhtred) is 35; Henry McEntire (Æthelwold) is 28. I haven’t been able to find the age of the actor who plays the Ætheling Edward, but in 998 the real Edward would have been in his early 20’s. It was a young man’s world back then. Alfred the Great’s brothers probably all died in their 20’s. And in 1066, William the Conqueror was only 38 when he won that battle at Hastings. Now, let’s see which characters survive the next episode. The full ten episodes – yes, 10!! – of the third season of THE LAST KINGDOM are streaming now on Netflix. The season will cover book 5, THE BURNING LAND and book 6, DEATH OF KINGS of Bernard Cornwell’s Saxon Tales series. Historically, it covers events that took place in England in the final decade of the 9th century. This first episode begins with a sorceress’s vision of a battle and concludes with the battle itself. And now I’m afraid I have to plead a bit of disappointment at the casting of the actress who plays the sorceress Skade (whose prophecies, by the way, may or may not be true). In the novels Skade has a regal beauty. She is tall and lithe, with hair the color of Odin’s ravens. She is unquestionably evil and cruel and creepy. Theo Sofie Loch Næs, who plays Skade in the series, while she does a terrific job in the role and seethes with gruesome, nasty cruelty, simply cannot change the fact that she is a winsome blonde. Time has skipped forward a bit. Alfred’s son Edward (Timothy Innes) is now a young man and joins the royal family. Many familiar and favorite faces are back, though. Ælswith (Eliza Butterworth) is still tight-lipped and disapproving of all things Uhtred. Æthelflaed (Millie Brady) has a baby daughter now and her husband Æthelred (Toby Regbo) the pathetic coward knows it’s not his. Alfred’s nephew Æthelwold (Henry McEntire) is as smarmy and smart mouthed as ever, and Steapa (Adrian Bouchet) is still Alfred’s giant supporter and Uhtred’s friend. Gisela (Peri Baumeister) is pregnant again and teasing Uhtred about it, with Hild (Eva Birthistle) and Thyra (Julia Bache-wig) attending her. Uhtred’s retainers Finan (Mark Rowley), Sihtric (Arnas Fedaravicius), and Osferth (Ewan Mitchell) bring a bit of comic relief, thank goodness. I loved the bit that series writer Stephen Butchard added about the meaning of the word ‘smite’. King Alfred (the remarkable David Dawson) seems to have aged the most of all the characters, and he cannot control his trembling when his illness gets the better of him. He knows that his days must be numbered. His moments of self-doubt and concern for what will happen to his kingdom when he is gone are wonderfully moving. Constant war was rough on kings, but Alfred managed to rule an embattled Wessex for 29 years. In fact, I found this episode more visually violent than in earlier seasons. There is more gore, so be prepared. Some of that has to do with portraying Skade’s horribly cruel acts in order to reinforce just how terrible she is, not to mention slightly mad. The plot varies from the book somewhat in the details, but in the main it is true to Cornwell’s novel. As the hour ended, the action had covered a little more than one third of THE BURNING LAND. If you are like me, you will want to immediately move on to Episode 2. Cnut the Great, England’s Viking king, died on Wednesday, 12 November, 1035. Cnut’s birth date was not recorded, but it was likely some time in the 990’s, so he was probably in his early to mid-forties when he died at Shaftesbury Abbey, a foundation favored by the king. Shaftesbury was the burial place of a previous, Anglo-Saxon king of England, Edward the Martyr, and it is tempting to think that Cnut might have been at the abbey because he was ill and he wanted to pray for the intercession of the sainted king (who by all accounts was no saint, but that’s another story.) Shaftesbury was an abbey of nuns, so it’s also possible that he was there to be tended by the sisters in hopes of recovering from whatever was ailing him. According to Cnut’s biographer Timothy Bolton, Cnut would have been surrounded by members of his court and his huscarles. I imagine that his queen, Emma, was with him as well. We cannot be certain of any of that, but kings of that period rarely went anywhere alone. Although he was a viking, Cnut was a Christian. His mother, a Polish princess, would certainly have insisted that her children be baptized; Cnut’s baptismal name was Lambert. During his reign as England’s king he made a pilgrimage to Rome where he not only took part in the coronation ceremony of the Holy Roman Emperor but made visits to every sanctuary he could find in the city. It would have kept him busy, to be sure, but he also spent a good deal of his time there negotiating diplomatic and trade agreements for the benefit of the English. Queen Emma & King Cnut. New Minster Liber Vitae, 1031. British Library, Stowe 944, fol.6. 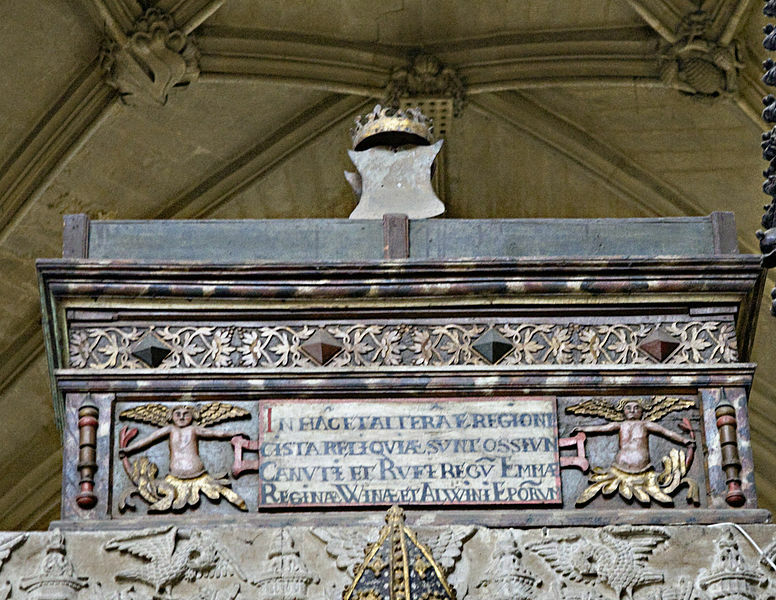 Cnut was buried in the minster at Winchester, although his remains are currently undergoing examination along with those of Queen Emma and several other royals whose bones are all mixed together in the same mortuary chest. The examiners at the University of Bristol hope to identify and separate the remains, and determine the physical characteristics of each through DNA testing. When the findings are complete, we may know a great deal more about the appearance, and perhaps even the cause of death, of England’s Viking king. And all the nobility of the English nation was there undone! On the 18th day of October in the year 1016 a great battle was fought between the forces of the English king Edmund Ironside and the Danish prince Cnut, younger son of Swein Forkbeard. According to the 12th century chronicler William of Malmesbury, Cnut had sailed to England in 1015 at the head of a massive fleet with the intention of either capturing the English throne or dying in the attempt. 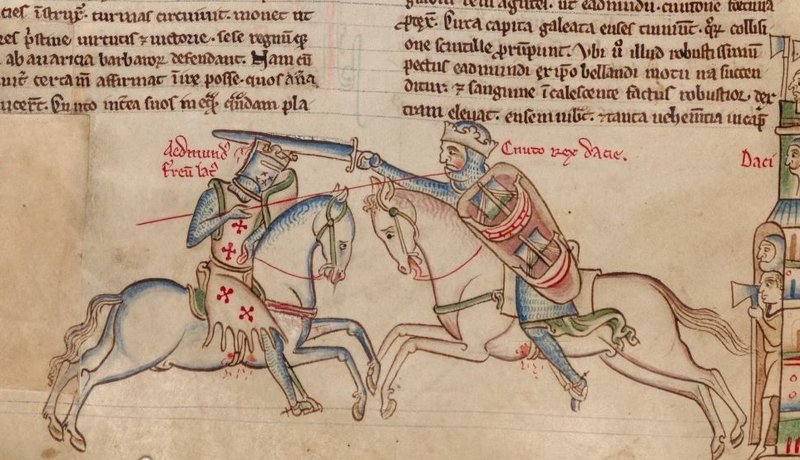 Over the course of the next year the two war leaders met in battle four times, with Cnut unable to secure either the decisive victory he so desired or the death that Edmund Ironside would so willingly have granted him. Not until that fateful day in October would the rivalry for the English throne be decided on a down in Essex called Assandun. Today, the site of that battle is claimed by both Ashingdon in southeast Essex and Ashdon, about 50 miles farther north. In a paper published in 1993, archaeologist Warwick Rodwell carefully considered both sites, but hesitated to definitively state that one or the other was Assandun. Nevertheless, Rodwell’s careful review of the Anglo-Saxon Chronicle (ASC) account and its tactical implications, along with his boots-on-the-ground research convinced me that the northern site, at Ashdon, is where the battle was fought. So, how did that happen? The earliest account, the ASC, puts the blame for Edmund’s defeat squarely on the shoulders of the villainous Eadric Streona, who “first began the flight and so betrayed his natural lord”. Eadric had allied with Cnut in 1015 but had deserted him for Edmund when the Danes appeared to be on the losing side in the weeks before this battle. In using the term betrayed, the ASC seems to imply something more sinister than mere cowardice. The encomiast claimed that the battle lasted all day—a very long time for a battle in this period—and that although the English had more men, they lost more men, too, than the Danes. It seemed to the English that the Danes were not so much fighting as raging (berserkers? ), and that the Danes were determined to die before they would withdraw. When night fell, the English, weary and disheartened, retreated and Cnut was left master of the slaughter field. It seems clear that whether Eadric Streona fled before the battle began or retreated in the midst of the fray, he betrayed his king and directly impacted the outcome of the battle. Cnut’s collusion with him is somewhat less certain; made even more so by the fact that within a year he executed Eadric ‘most justly’ for his betrayals. Edmund, apparently not yet willing to concede defeat, fled across England with the remnant of his army to Gloucester, with Cnut on his heels. 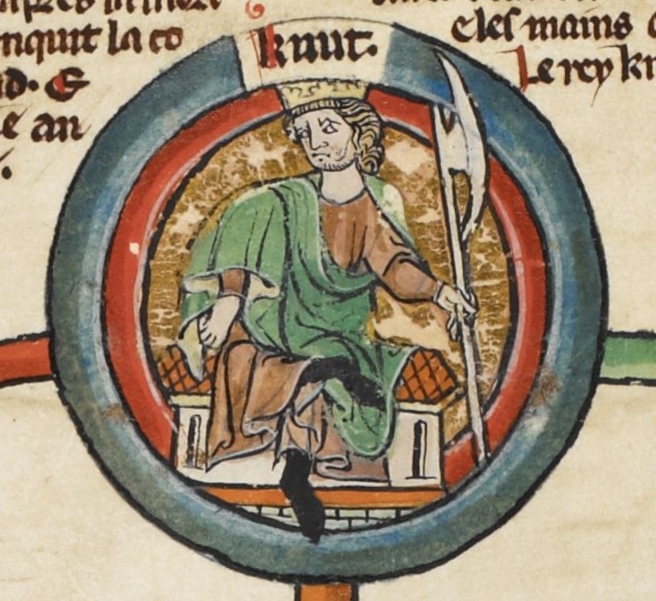 There, the treacherous Eadric, who had a foot in both camps, brokered a settlement between them that divided England, with Edmund keeping the southern shires of Wessex and Cnut taking Mercia and the north, including the mercantile powerhouse that was London. At this point, according to the Encomium, God stepped in: within a month Edmund was dead, likely from wounds or from an illness he suffered in the aftermath of Assandun. Soon after, Cnut was proclaimed king of England. The Battle of Assandun, which put a Dane upon the English throne, is not as well known as that other battle that was fought exactly fifty years later at Hastings and resulted in a Norman takeover. There is no Tapestry that depicts the battle of 1016. But in Denmark, in the King’s Corridor of Frederiksborg Castle, both events are commemorated, for both Cnut and William came from Danish stock. 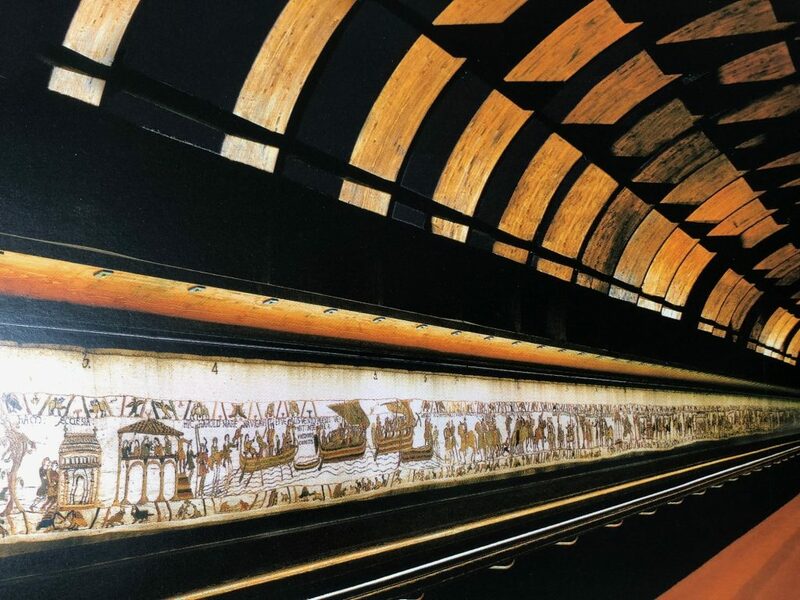 On one wall is a hand-painted photographic copy of the Bayeux Tapestry. 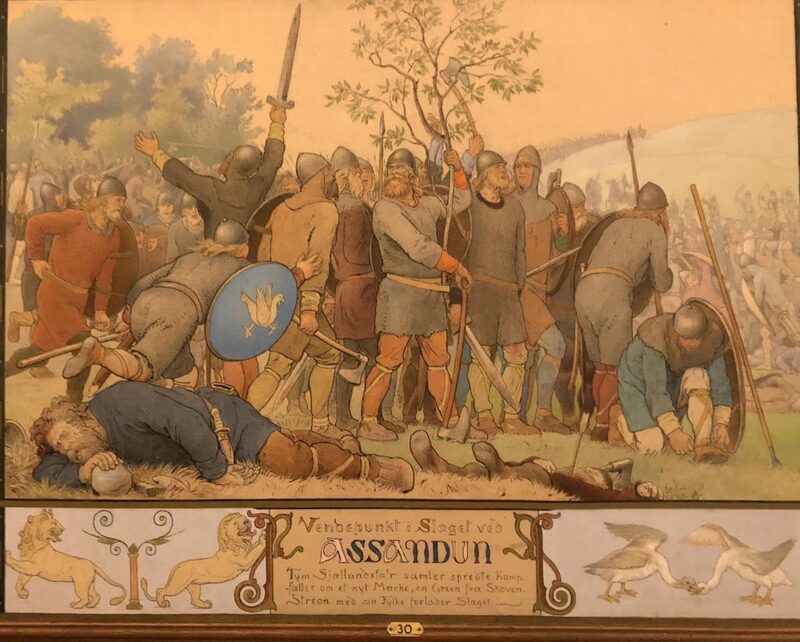 Facing it is a series of 19th century paintings documenting the 11th century Danish conquest of England, with several depictions of Cnut’s great victory at the Battle of Assandun prominent among them. Where has the horse gone? Where is the rider? Where is the giver of gold? Where are the seats of the feast? Where are the joys of the hall? O the bright cup! O the brave warrior! 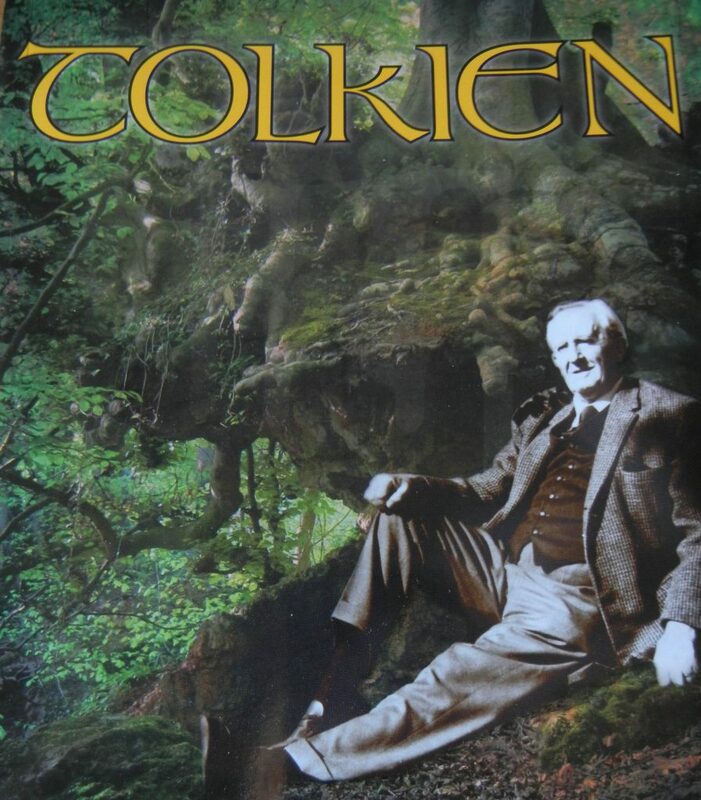 Most fans of J.R.R.Tolkien know that he was not just the author of one of the greatest works of fantasy ever written, but that he was a professor of English at Oxford and, for many years, the Rawlinson and Bosworth Professor of Anglo-Saxon. He was, essentially, steeped in the language, history and poetry of Anglo-Saxon England. 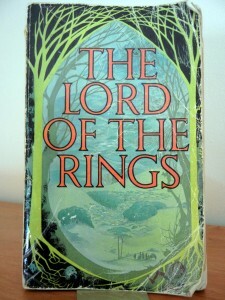 So it is no surprise that even the title of the trilogy that brought him fame, The Lord of the Rings, is a reference to Anglo-Saxon kings who were warriors, lords, and ring-givers. The name of that place is Edoras, from, I can only guess, the Old English word edor, which means ‘a place enclosed by a hedge’, just as Legolas describes it. Indeed, the very concept of a great hall comes from the cultures of the Anglo-Saxons and the Norse. And of course there are words like shire (OE:scire—precinct), orc (god of the infernal regions), ent (giant), Mordor (OE: morþor—great wickedness), Deagol (secret), or Isengard (Iron fortress). Many scholars, in particular Nancy Marie Brown in her recent book Song of the Vikings have written about the Norse/Icelandic elements in Tolkien’s novels; but it seems to me that Rohan is more Anglo-Saxon than Norse – although, admittedly, both societies sprang from common Germanic roots. The name Eowyn, for example, is strikingly similar to the Old English theowen, meaning hand-maiden. And because I cannot read about Eowyn’s exploits in The Lord of the Rings without thinking about Æthelflæd, 10th century Anglo-Saxon warrior queen and Lady of the Mercians, I have to wonder if Tolkien had Æthelflæd in mind when he imagined Eowyn. The 12th century historian John of Worcester describes King Æthelred as “…elegant in his manners, handsome in visage, glorious in appearance.” But by the beginning of the 11th century Æthelred is elderly, like Theoden, and has been long upon the throne. His kingdom is being ravaged by vikings as Theoden’s is under attack by orcs. As Theoden huddles in his great hall, unwilling to face the turmoil in his land or lead men to battle, so Æthelred earned a reputation as indecisive, cowardly, and indolent. And like Theoden, he placed his trust in a singularly bad advisor. Tolkien gives Theoden a counselor named Grima (OE: mask) whose nickname is Wormtongue (OE: wyrm-tunge). A wyrm is a serpent or even a dragon, and Grima is a master at twisting words to persuade Theoden to do his bidding. He is a liar and false counselor who is unmasked by Gandalf. Æthelred, too, has a false counselor, one Eadric, whom he trusted more than anyone else and whose nickname is Streona (the acquisitor). 12th century historians suggest that Eadric was able to gain advancement by his persuasive speech, and he acquired a reputation for deceit, treachery and murder. It is only when Æthelred is driven out of England to exile in Normandy and presumably no longer under the spell of Eadric that, like Theoden, he finds his courage again and returns to England to lead his armies against his enemies. He was referring specifically to theories connecting the wars in Middle Earth to World Wars I and II; but I think his comment can apply to anything that an author experiences – books read, languages learned, emotions experienced. Everything goes into the mind and one never knows what will re-appear, whether intentionally or not, in a manuscript. My own historical novels, while based on my study of the reign of Æthelred, are very much a product of my own imagination and experience, but I am certain that they owe something as well to my dog-eared copy of The Lord of the Rings. The charming town of Bayeux near the coast of Normandy is perhaps best known for its remarkable Tapestry, a very long length of embroidered linen that portrays events surrounding the Battle of Hastings in 1066. A few years ago I wrote about the Tapestry and its history on this blog, (you can review that here, if you like), but I had not yet visited Bayeux myself. 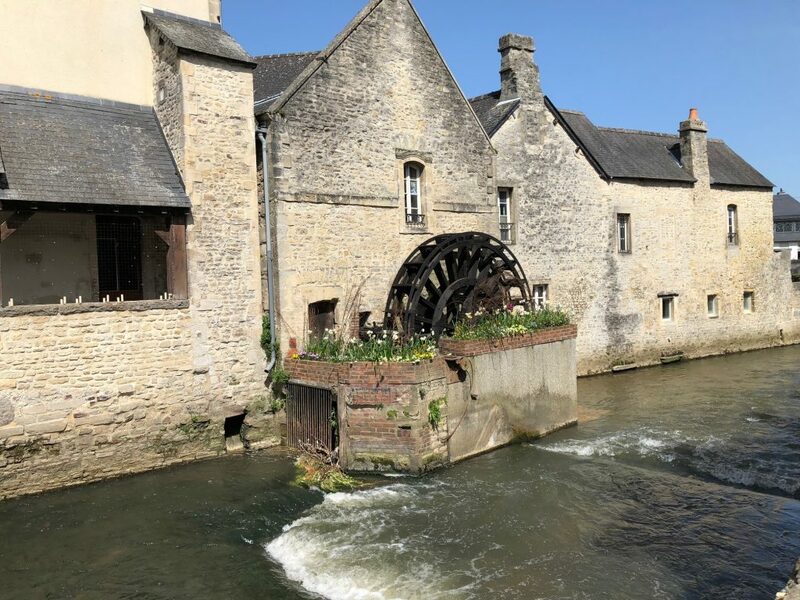 I had been to Normandy – to Rouen, Fecamp, the Abbeys of Jumieges and Wandrille, to Caen and even the island and abbey of Mont Saint-Michele, but I had missed Bayeux in my several trips to Normandy over the years. Last month, though, I spent a few days there, absorbing the Tapestry and its story with some help from the audio tour that, interestingly, tells the story from the French point of view. Which, as you may guess, differs in certain crucial details, from the English version of what happened. But today’s post is not about the Tapestry. No, it is about what I discovered unexpectedly as I wandered about the city of Bayeux: a direct link between Bayeux and Emma of Normandy, queen of England. 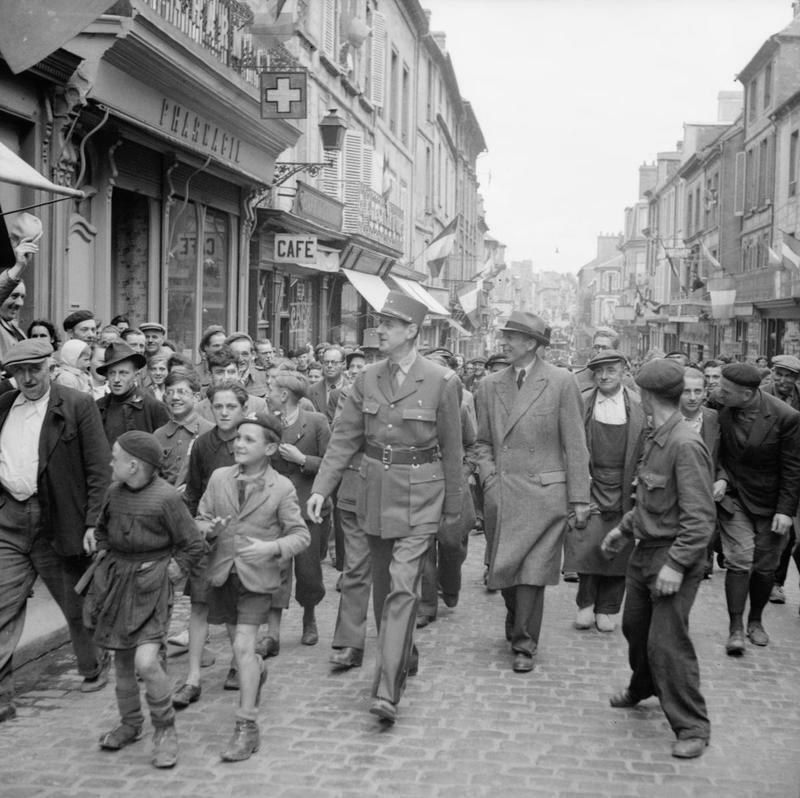 But long before that, in about 960, Richard I—Emma’s father and the first Duke of Normandy—built a castle on what is now Place Charles de Gaulle. Bayeux Castle was still standing until the latter part of the 18th century, and it’s entirely possible that way back in the late 10th century, Emma may have visited the castle with her family. Like all royals of that time, Richard’s court was peripatetic. It moved from estate to estate, or fortification to fortification, dispensing ducal justice and living off of local food rents. And hunting. And feasting. And probably sorting whatever problems had come up since the duke’s last visit. Bayeux Castle had a fortified gate to the west that allowed direct access from outside the city. It had another gate to the east, that overlooked the city and was equipped with a drawbridge over the defensive moat that surrounded it. It had a lodge for the castle commander, a chapel, barracks for the garrison, and a manor house. 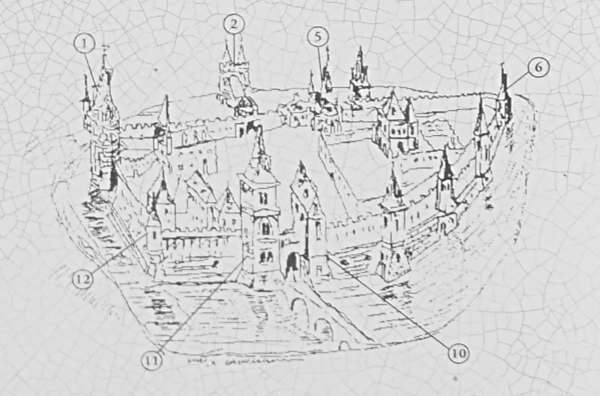 It looks pretty impressive in the drawing below, but my guess is that the first fortification, built by Richard, was much, much simpler. Moat, drawbridge, manor and all those towers you can see were likely added centuries later. Still, it was a ducal estate, and Emma might well have spent time there as a child. So. 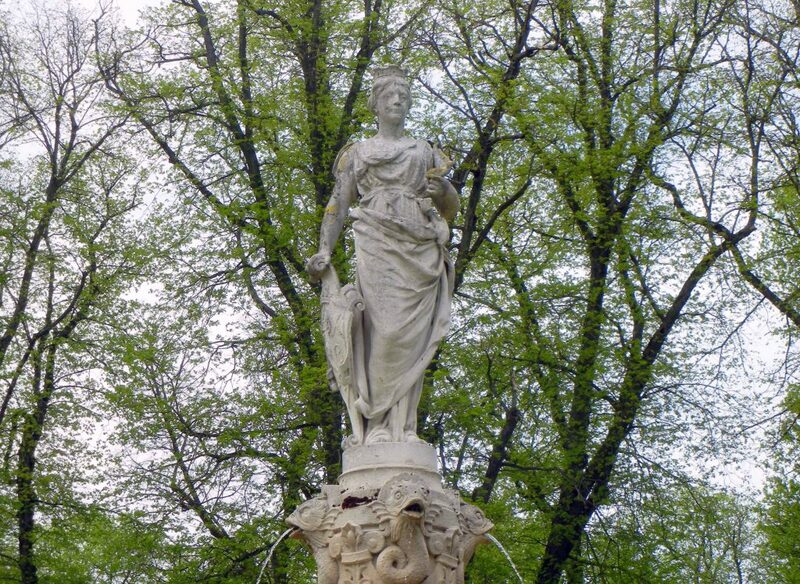 Who, exactly, was Poppa and why did she land on that fountain honoring the Norman dukes? Rollo in VIKINGS; played by actor Clive Standen. Photo: The History Channel. And if Rollo actually looked like that, the beautiful Poppa may have been smitten because Dudo goes on to report that Poppa became Rollo’s concubine. It’s just as likely that Poppa had no say in the matter whatever, and Rollo would later set Poppa aside to marry Gisela, the daughter of King Charles the Simple. Marriage in the 10th century was all about political alliances, not personal preference. Gisela, though, was childless, and she fell into disgrace for insulting her husband and for entertaining Frankish men on the sly. Apparently she preferred Franks to vikings, or maybe Rollo hadn’t put Poppa as far aside as Dudo would have us believe. Because when Gisela died, Rollo took up with Poppa again, and it was Poppa who was the mother of Rollo’s heir William Longsword, who was in turn the father of Richard I, who was in turn the father of Emma. So that makes Emma the great-granddaughter of Rollo and Poppa. Note: The tv show VIKINGS would have you believe that Gisela was the mum of Rollo’s children. Not so. It was the beautiful Poppa, Berenger’s daughter–at least, according to Dudo. And he was there. Bordering the park and within sight of the fountain is the Hotel Particulier Poppa. Hotel particulier is the French name for luxurious city mansions. This one was built in the 19th century and now it is an actual hotel—something I did not realize until after I left Bayeux. It seems that I might just have to return there one day—to visit the Tapestry again and to stay in the lovely hotel named after Emma’s great-grandmother.